cnes | What is space? For millions of years, space was out of reach for humans stranded here on planet Earth. Like any inaccessible object, it was much dreamed about and inspired many different interpretations. Indeed, for centuries the heavens were believed to be the realm of the gods bathing in everlasting happiness. Humans had to find out the truth, and the only way was to see things for themselves. When they got there, they found no divine presence but a strange place without air, noise or smells. Space proved to be a paradox of nature, at once so empty and yet so hostile, both a world of silence and a source of incredibly high-energy phenomena. Such energy in a sea of emptiness has taxed the minds of scientists and changed our view of the world forever. Although our intuition tells us that space is a very dark medium all around us, at some point in our lives each of us has wondered just where its exact boundaries lie: Where does space begin? Where does it end? What is the difference between space and the Universe? We consider the Universe to encompass everything that exists. Space is what lies between us and the stars, and between the stars themselves. From our Earth-bound perspective, it is beyond our planet's atmosphere. But the boundaries of space are impossible to define clearly. The atmosphere, the envelope of gases that shrouds and protects our planet, becomes less dense with altitude. At an altitude of 200 kilometres above our heads, a residual atmosphere is all that remains. Atmospheric pressure falls with altitude. At 400 kilometres above Earth, only a residual atmosphere remains, although it still contains some 100 million atoms and molecules ! So the lower limit of space cannot be pinpointed at an exact altitude. As for its upper limit, we can’t even be sure that there is one—since that would mean defining the boundaries of the Universe itself. Is space finite or infinite? Scientists are still debating the issue. What we do know, however, is that it is indefinite. Space contains so little matter that we can consider it empty. Such emptiness is hard for us to imagine, since on Earth matter is everywhere in liquid, solid or gaseous form. In the words of Aristotle, “nature abhors a vacuum”. In space, there is no night and no day. 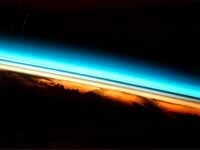 Earth's gaseous atmosphere scatters the Sun's rays, giving the sky its blue colour. But space lacks a dense atmosphere, so it remains in perpetual darkness. Likewise, sound vibrations can only propagate in a medium. In the vacuum of space, there is no such medium—and therefore no sound! Space may be a vacuum, but we would be wrong to conclude that nothing ever happens there. In fact, space has quite a few surprises in store. For example, exchanges of energy do take place in space, but only by radiation. The light of the stars reaches Earth, which shows that it can travel through a vacuum. Similarly, radio waves convey communications between satellites and Earth. To be more precise, radio and light waves are electromagnetic waves, which can propagate without a medium, as opposed to sound waves and waves in a fluid, which are disturbances in a medium. Another important detail to remember is that the vacuum of space is not total, since we find atoms, dust and solid debris of all kinds there. Is space hot or cold? There is no simple answer. Without the Sun, the Earth and other stars, the temperature in space would be extremely low: –270°C to be precise. The stars are sources of heat that create significant temperature variations between objects and between two sides of the same object. 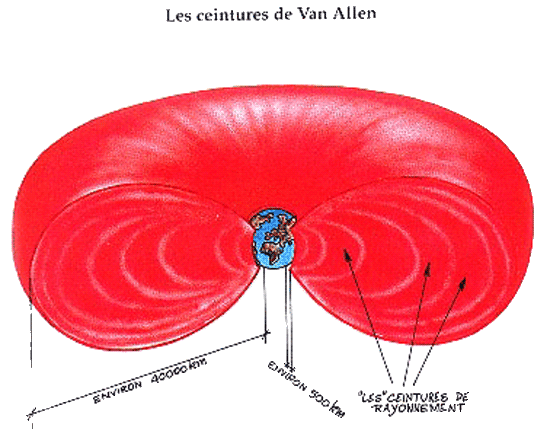 In the vacuum of space, only radiation allows heat to propagate, since the other two mechanisms require a medium. As a result, temperature differences remain high. 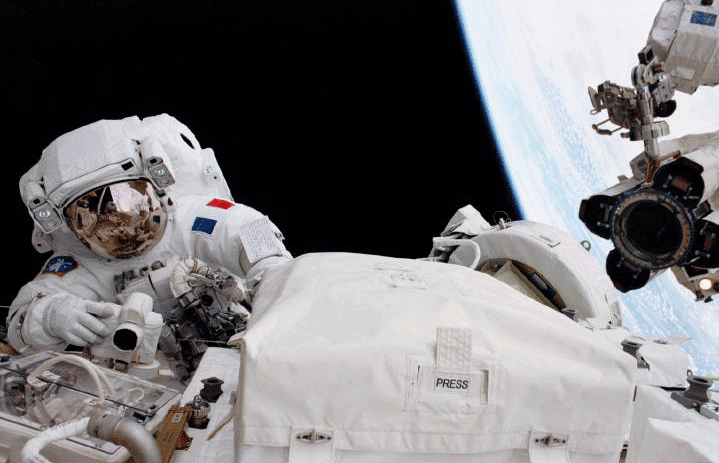 Astronauts are protected from extreme temperatures by a complex “suit of armour” that is rigid and fully tight. At an altitude of 400 kilometres, the temperature can drop from +120°C to -150°C in minutes. Seen from Earth, everything seems so peaceful and quiet in space. Yet the truth is quite different. In fact, the Earth’s atmosphere and magnetic field act as a shield protecting us against the harsh conditions of an environment much more violent than we imagine. For example, the Sun is constantly shedding a stream of particles and radiation, called the solar wind, which would be mortal to humans. Every year, massive outbursts of energy called solar flares are also hurled into space at speeds of up to 50,000 kilometres per hour. At a scale closer to Earth, the solar wind combines with the flux of particles ejected by star outbursts to form cosmic radiation. It has also been discovered that these particles form what are called the Van Allen radiation belts circling the Earth at an altitude of 500 to 40,000 kilometres. We may be safe down here on Earth, but up there in space the radiation dangers of solar flares, cosmic rays and the Van Allen belts are very real. These highly energetic particles damage the most sensitive spacecraft components and can be harmful to astronauts’ health, and indeed even fatal. Vast amounts of moving particles from cosmic rays circle the Earth at an altitude of 500 to 40,000 kilometres. 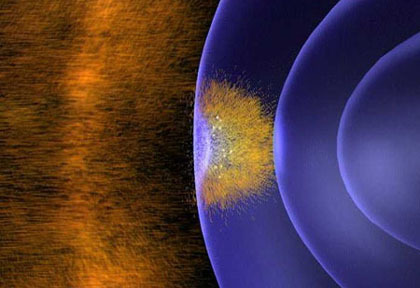 These belts of particles are shaped by the Earth’s magnetic field. Human-tended spacecraft usually orbit the planet at altitudes below 500 kilometres to avoid exposure to these high-energy particles. High up in space, satellites are keeping constant watch over Earth and relaying data, and astronauts are building orbital stations. Why do we find space so fascinating? To begin with, space offers an unrivalled vantage point to gain a global picture of the planet. For scientists working to protect the environment, satellite-based Earth observation has evolved into a field of study in its own right. Man-made satellites reach beyond borders and span vast distances. Space is therefore an ideal relay for communicating across the globe. Space also is often associated with weightlessness. But we often mistakenly assume that because space is so empty, this means there is no gravity. In fact, objects in space seem to be floating because they are orbiting Earth and travelling at the same speed (28,000 kilometres per hour). 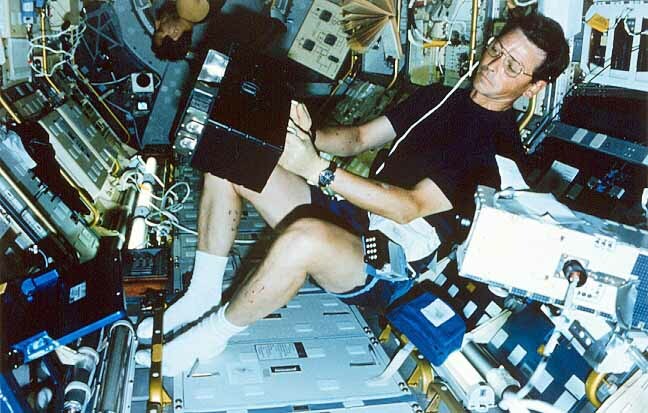 Space is the only medium able to maintain this state of weightlessness for more than a few minutes, which is why it is so valuable to scientists. Space is a unique laboratory that allows researchers to conduct new experiments in life sciences and material sciences that would be impossible on Earth. In the final analysis, what better way is there to prepare ourselves for interplanetary space travel than to get to know space better? It may indeed be hostile, but it is still a place we dream about and Mars is now tantalizingly within reach.